Blue Artichoke Interiors: Lovin' My Etsy Pillows! 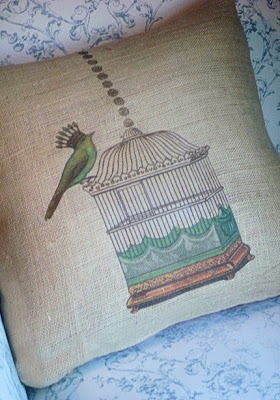 I recently purchased a few new pillows on Etsy which I love. I had a custom monogram pillow done for me by Peggy at Letter Perfect Designs. She is such a sweetheart and a pleasure to deal with. 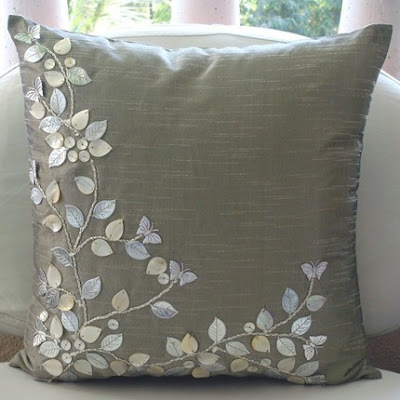 Here's my custom pillow on my not yet reupholstered Craig's List chair. Here's a close up of this pillow so you can appreciate how pretty it really is. 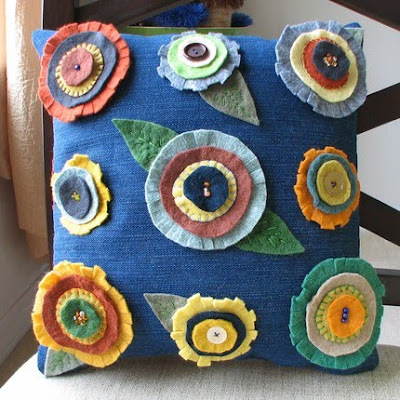 I just love what Peggy does with these buttons. I don't know if I would have the patience to sew all those mother of pearl buttons on. Here's a couple of more pillows that she offers that I love. 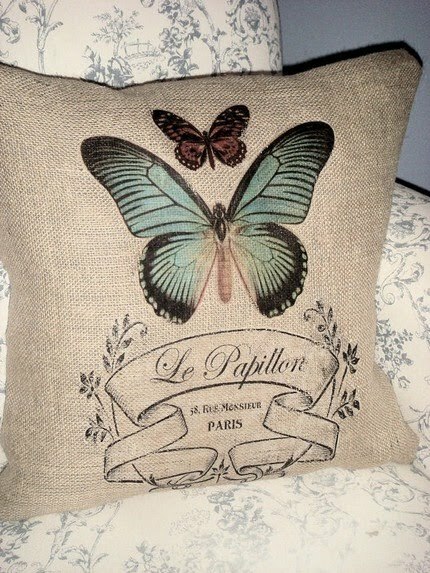 These would look wonderful in my oldest daughter's Parisian inspired bedroom! I also recently bought a couple of more burlap pillow from Jolie Marche Inspired Vintage. These look so pretty on my soon to be recovered Craig's List sofa. It did take me a while to get my act together and buy the pillow forms to go in these pillow covers. I just love to look through Etsy at all of the beautiful things that people make. I want so many things and yet I can't possibly buy them all. Here are a few more pillows from some of my Etsy favorite shops that have caught my eye. I love these folk art inspired pillows from Nestle and Soar. I love ruffles on pillows and this sweet ruffled pillow from Iviemade can be made in oodles of colors to match your decor. Last, but not least, is this sweet pillow from Vintage Chic Decor. 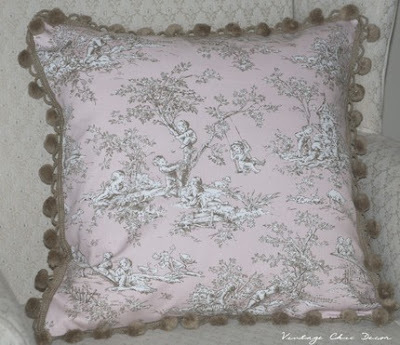 I am a sucker for toile and, well, add in the pom pom trim and I am in love. 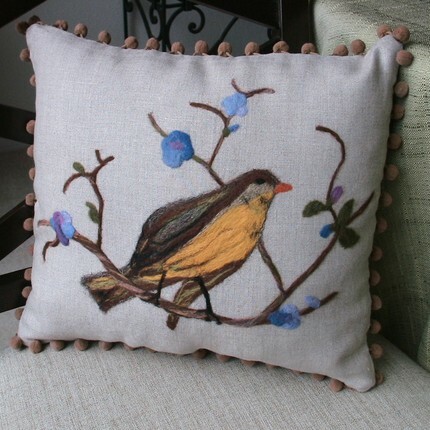 Are there any Etsy shops that you think I should know about and cannot live without? I would love to hear from you, so please share!!! 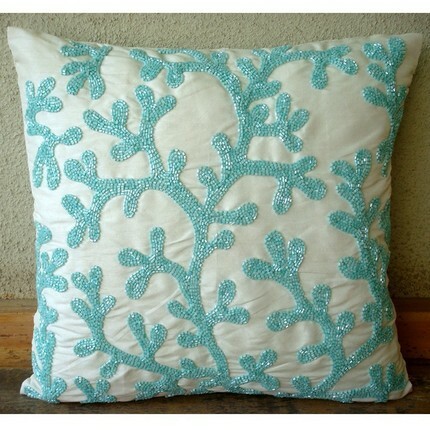 Those are some gorgeous pillows! 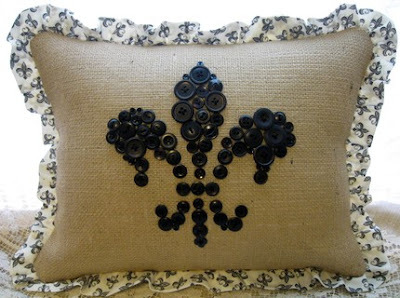 I love the button fleur-de-lis and the leafy one and OK all of them! 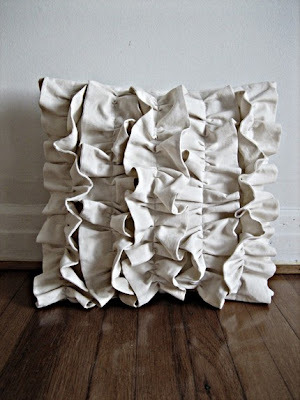 Thanks for featuring my ruffled pillow! 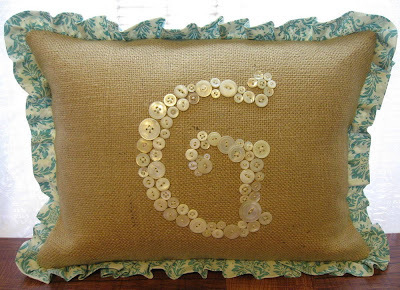 I love pillows. Why my kids can't respect them and keep them off the floor where they are trampled, I'll never know. Love the colorful felt flowers! What great pillows, and would you believe I have a pair of chairs very similar to yours that I got at a thrift store about 4 years ago? Seeing all of the lovely pillows makes me think you need a bigger couch! 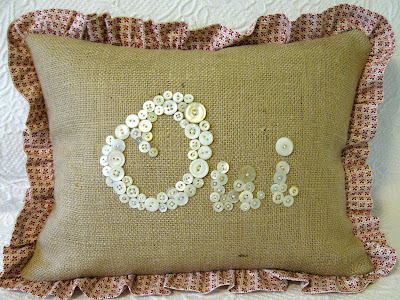 I am a huge fan of vintage buttons, and I'd love to know how silkscreening looks so great on burlap. I'll need to poke around and see...thanks for this. I'm glad you are a new follower!